Emily Buege is a Research Scientist for the Wisconsin Department of Natural Resources (WDNR) and a database manager and spatial analyst on the Snapshot Wisconsin project. She has a B.S. in Ecology and a M.S. in Geography with an emphasis in environment and natural resources. Emily’s thesis research involved species distribution modeling of native fish in the Bladen River, Belize. Great Blue Heron with a turtle in its beak. Let’s discover our wildlife together! Snapshot Wisconsin is a volunteer-based project which utilizes a statewide network of trail cameras to monitor wildlife year-round. From coniferous forests to vast prairies volunteers host trail cameras throughout Wisconsin’s landscapes. The photos of diverse wildlife captured on Snapshot Wisconsin cameras such as these here are hosted online where they can be classified by volunteers across the globe. 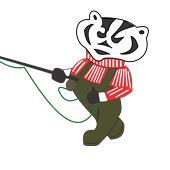 The resulting data set is used to inform WDNR management decisions and helps it learn more about Wisconsin’s wildlife. The project is also a unique opportunity for individuals, families, and students to get involved in monitoring the state’s valuable natural resources. Additional information about Snapshot Wisconsin can be found on its webpage and you can visit this website to view and classify images captured on all the project’s trail cameras. Please note that Emily can not divulge the remote Northern Wisconsin location where one of these pictures was taken because it would become an instant tourist attraction that would likely overrun the area. Get ready to see some beautiful pictures of wildlife in a natural setting and to learn how you might participate in this exciting project! This meeting is a joint Holiday Party with the Wisconsin Smallmouth Alliance (WSA) at the Maple Tree restaurant on Highway 51 in McFarland. New this year is that attendees will need to RSVP by Dec. 3rd via email to either Mike Simon at madisonmike@tds.net or Jerry Pasdo at japasdo@gmail.com with your number of dinner attendees. The meeting begins at 5:30 with a social hour followed by a family style dinner served at 6:30. The presentation will begin following dinner and the cost is $18 which includes the tip. Payment needs to be made in the exact cash amount or via a check payable to WSA. Hope to see you on Tuesday, December 11th to be educated about the WDNR’s Snapshot Wisconsin project!